my dad turned 60 this past weekend so i decided to make him some cookies. 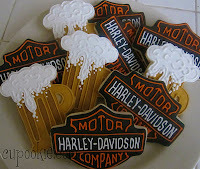 what better way to say happy birthday with some manly cookies haha. harley davidson logos & beer mug cookies seemed to fit well.